Dr. Charlotte Atsango Serrem is a Senior Lecturer in Food Science and Nutrition in the School of Agriculture and Biotechnology, Department of Consumer Science of the University of Eldoret in Kenya. She obtained BEd Home Economics from the University of Nairobi, Kenya in 1985 and a combined Food Science and Human Nutrition MSc from the Universities of Strathclyde and Glasgow in UK in 1996. She earned a PhD in Food Science/Nutrition from the University of Pretoria, South Africa in 2010. Charlotte has taught a variety of courses in the areas of Food Science, Nutrition and Microbiology in the Universities of Moi, Eldoret and East Africa, and has been involved in development of curricula in these areas. She has supervised students’ undergraduate and postgraduate research and theses and is a reviewer of a number of local and international journals. She has also published in reputable International and local journals and presented papers in both national and international conferences. Her research interests are in food quality and product development with special focus on utilization of staple foods and appropriate technologies to improve food security and solve malnutrition problems in Africa. 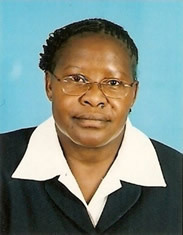 She has collaborated or provided specialist services on projects funded by Moi University, AICAD, VLIR and GL-CRSP on indigenous milk processing and preservation, sorghum protein quality and, developed nutritionally optimized therapeutic foods for HIV and school feeding, using food, sensory and nutritional sciences then tested using human studies and rat models. She is married to Dr. Cornelius Serrem and they have three children. Celebrating Achievement-AJFAND Reviewer and just got his PhD from Taipei Medical University in Taiwan. In September, 2010, I was granted International Student Award (ISA) scholarship by Taipei Medical University (TMU), Taiwan, to pursue Ph.D. degree in Nutrition and Health Sciences. 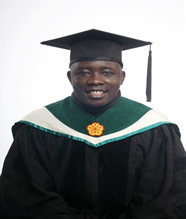 Having worked briefly as an Assistant lecturer at the Institute of Food Bioresources and Technology, Dedan Kimathi University of Technology, this was a great opportunity for me to realize my life-time career dream of a Ph.D degree. Taiwan is amongst countries considered to have the best healthcare system for its citizens. Besides, TMU enjoys an internationally renowned status in health-related research, and attracts many aspiring and established scholars from different countries. It was my utmost desire to have an opportunity to learn and share new scientific ideas with these people. During my 4-years stay at TMU, I was amazed by the highly computerized education system especially getting up-to-date information in my researchfield.My Ph.D research mainly focused on nutritional immunology.The rapid rise in prevalence of allergic diseases is a matter of public health concern especially among the children, thus the need for alternative nutritional preventive interventions. The pathogenesis of allergic rhinitis is associated with skewed T helper cells (Th1/Th2) immunobalance and subsequent sensitization of mast cells by allergen-specific immunoglobulin(IgE), which results in release of inflammatory mediators. Furthermore, activated mast cells undergo major metabolic reprogramming, primarily using aerobic glycolysis to support the effect or functions upon allergen stimulation. I studied the immunomodulation potential of Lactobacilli kefiranofaciens M1 in animal model and human subjects with allergic rhinitis. In addition, I investigated the modification role of dietary polyunsaturated fatty acids (PUFA) on the metabolism profile of activated mastcells and the implications on the release of inflammatory mediatorsin cell culture model. The findings of my dissertation underscored the potential novel role of dietary Lactobacilli kefiranofaciens M1 and α-linolenic acid (an n-3 PUFA) towards prevention of allergy-related inflammation through immunomodulation and cellular bioenergetics mechanisms, respectively. Nutrition has a great influence on our health; therefore, to safeguard and improve health we need more specialists in nutrition. Studying atTMU had a great impact on me; it was a very worthwhile experience. The thesis study particularly widened my skills and knowledge in nutrigenomics and bioinformatics approach in research. As a trained food technologist and nutritionist, I feel greatly indebted to contribute towards the formulation of novel nutritional strategies aimed at the alleviation of common diseases found in our local communities. As a university lecturer, this training will enable me to assist students to design and execute studies directed at unraveling the nutrients-health interaction surrounding numerous diseases and/or disorders with the main objective of developing the most appropriate nutritional therapeutic targets. I will continue to participate in community outreach programmes particularly those involving community nutrition and public health education in order to improve livelihoods through management of nutrition and health. I am grateful to Prof. Paul Kioni, Vice Chancellor, Dedan Kimathi University of Technology, Kenya, for granting me study leave to pursue Ph.D degree studies in Taiwan. My gratitude also goes to Prof. Ruth Oniang’o (Editor-in-Chief, AJFAND) and the entire AJFAND team for the motivation and encouragement during my stay in Taiwan.